TAOS — The town of Taos says it will work with Taos County on a plastic bag ban meant to reduce litter and encourage the use of reusable shopping bags. The details of the proposal are still being discussed, but town officials are looking to Santa Fe as a model. They have acknowledged that it will be important to include local merchants if the council chooses to go forward. Nancy Keane, a spokeswoman for Albertsons, said the company would support Taos in whatever decision the council makes. She said Albertsons, which operates stores in Taos and Santa Fe, encourages plastic bag recycling by posting bins at storefronts. Councilor Fernandez presented the Santa Fe ordinance banning plastic bags at a Town Council meeting earlier this week. Santa Fe passed its first plastic bag ban in 2013 in the hopes that it would promote the use of reusable bags. The new rules went into effect in February 2014. But a survey in December 2014 found the impact was limited. Between 11 percent and 18 percent of grocery store customers brought their own bags, the report found. Instead, the plastic bag ban had mostly increased the use of paper bags. To curb the trend of rising paper bag use, the report’s authors recommended adopting a fee for the use of paper bags. In April 2015, the Santa Fe City Council did that, adopting a 10-cent fee that stores are required to charge shoppers for every paper bag they use. Under the ordinance, 9 cents from the fee is to be remitted to the city for “environmental education programs” and reusable bags to distribute to residents for free. Stores are allowed to keep one penny. An April 27 memo written by Santa Fe city staff said the city had noticed far fewer plastic and paper bags in collected garbage since the fee was enacted. According to city spokesman Matt Ross, Santa Fe collected $126,000 through the fee in 2015. That comes out to about 1.4 million paper bags sold that year. 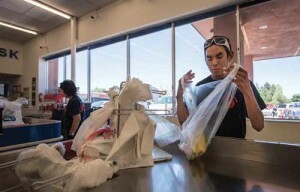 Cheryl Sommer, president of Kaune’s Neighborhood Market in Santa Fe, said her store voluntarily phased out plastic bags before they were officially outlawed. Sommer said most customers weren’t upset when plastic went away. Occasionally, one would complain that they wouldn’t be able to reuse them to pick up after their dog or as a bathroom trash bag. “Some were disappointed, but that subsided pretty quickly,” Sommer said. A year after the fee went into effect, Sommer said, she’s noticed an impact. “I think it has probably reduced [disposable] bag use,” she said. Sommer did say the requirement to collect, then remit the 10-cent fee was yet another administrative task for her business. She said the penny that she got to keep was hardly enough to cover the time it took. For larger grocers, Sommer said, the bag ban probably had a bigger impact. With a larger volume, that savings could add up.